I’m much more of a breakfast for dinner type of person than I am a breakfast for breakfast type of person. I think this is because up until I was 16 or so, the thought of eating food before 9 am was just not possible. Even the smell of breakfast made me nauseous. I could maybe handle a few crackers first thing in the morning, but absolutely nothing like french toast. So every once in a while when I actually have a breakfast craving, I make it for dinner. Who has time in the mornings for something more than a muffin or some instant oatmeal? And if you do, I’m jealous. 1. Spray a 9×13 baking dish with non-stick cooking spray. 2. In a large bowl, whisk together the egg substitute, eggs, milk, Splenda, and vanilla. Soak the bread into the mixture and then place in the prepared baking dish. Pour the remaining mixture over the bread in the dish. 3. Cover with foil and refrigerate overnight. 4. Preheat the oven to 350. 5. Bake the french toast for 45-50 minutes or until lightly golden. 6. Serve with butter, powdered sugar and/or syrup. To be honest, this really wasn’t my thing. 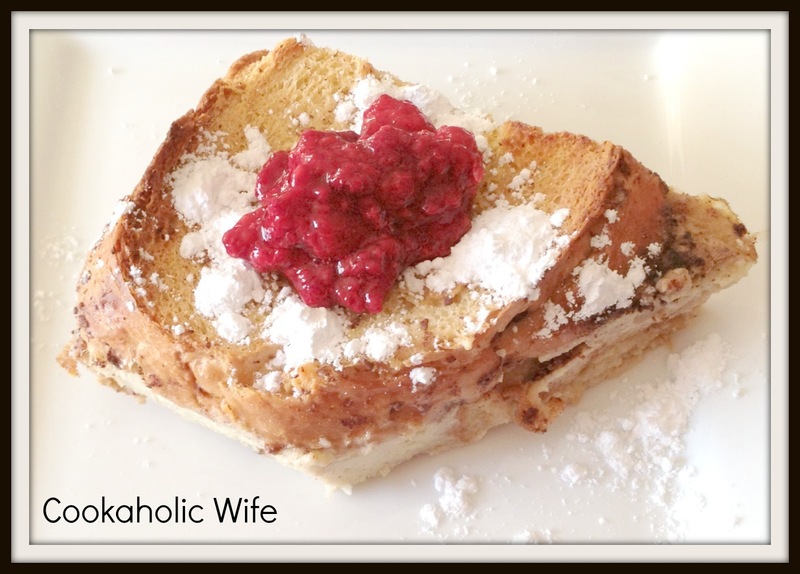 I thought I would like baked french toast better, but it wasn’t anything fabulous. Tom loved it however, so I’m sure I’ll make it again. Oh, on top is 10 oz. of frozen raspberries left to thaw until room temperature and then mashed with 2 tbsp. Splenda.